AS A CANDIDATE for president in 2008, Barack Obama insisted that one of the biggest problems in America was a shortage of federal regulations. He lambasted his opponent, Republican John McCain, for calling himself a "deregulator." He blamed the nation's economic crisis on deregulation run amok — on policies designed to "strip away regulations, consumer protections, [and] let the market run wild." Once in office, Obama revved up the federal regulatory engine. In a 2010 story headlined "With Obama, Regulations Are Back in Fashion," the New York Times reported on the "the surge in rule-making," and on how the new Democratic administration "has pressed forward on hundreds of new mandates, while also stepping up enforcement." 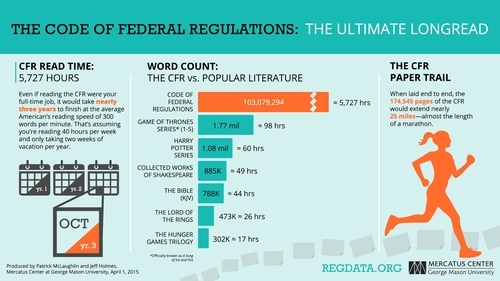 By 2010, the number of pages in the Federal Register (the government's official journal of proposed and finalized agency regulations) had rocketed to 81,405, a record high. In 2016, the page count soared even higher record: 95,894. Donald Trump came to office singing from a very different hymnbook. During the 2016 campaign, he promised to slash federal regulations, declaring at one point that "70 percent of regulations can go." Within days of his inauguration, he signed an executive order directing federal agencies to cut two existing regulations for every new regulation they issue. Fourteen months later, according to the Competitive Enterprise Institute, a Washington think tank, Trump can legitimately take credit for having slowed the regulatory juggernaut. In "Ten Thousand Commandments," its annual report on the scope and cost of federal regulations, CEI credits the current administration with "the most aggressive effort at regulatory reform in over a quarter century." To be sure, it hasn't scrapped anywhere near 70 percent of all regulations — that was the usual Trumpian hyperbole — but it has, in CEI's words, "slowed the momentum of the Obama years and implemented policies to incentivize further restraint." In his first year as president (the CEI report covers developments in 2017), Trump signed measures cancelling 15 recently finalized Obama-era federal rules. These included, among others, a Federal Communications Commission regulation governing internet privacy, a sweeping gun-control rule curbing the rights of people with mental disabilities, and a rule restricting the ability of banks to require that consumer disputes be settled through arbitration. The administration also pulled the plug on 1,579 (!) rules proposed but not yet finalized by the Obama administration. The Federal Register page count was way down, too — to just 61,308, the fewest since 1993. Of course it isn't possible for any president to simply turn off the regulatory spigot. 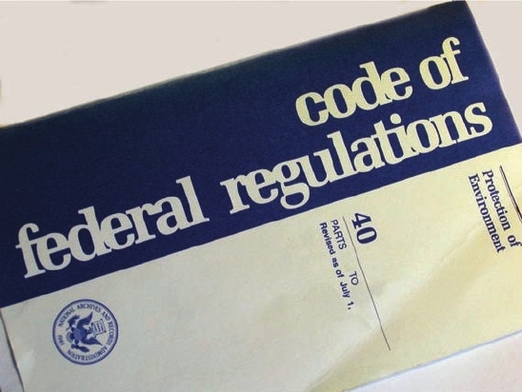 In many cases, statutes passed by Congress require federal agencies to draft new rules and regulations. For instance, the Dodd-Frank law, passed in the wake of the 2008-2009 financial crisis, mandated the creation of 400 rules to fill in the many details Congress left unspecified. Moreover, a federal law (the Administration Procedure Act) provides that a new rule must be written in order to eliminate an old rule. Overregulation is not a trivial problem. The regulations imposed by federal agencies extract an estimated $1.9 trillion a year from manufacturers, vendors, farmers, and consumers. Regulatory overkill is a significant drag on economic growth. No reasonable person denies the need for wise and well-crafted regulation, but so much of what the federal behemoth pumps out is onerous and unnecessary. Mandates and restrictions ratchet up inexorably, often doing little or nothing to improve health, safety, or fairness, but paralyzing entrepreneurs, stifling innovation, and punishing consumers with higher and higher costs. Which means that while Trump deserves credit for eliminating red tape, it will take a far more aggressive effort, and significant help from Congress, to effect any lasting drainage of the regulatory swamp. In 2017, even this most regulation-averse administration signed off on 3,281 new federal rules, and another 1,834 were in the pipeline at year's end. If Trump truly intends to be the Deregulator-in-Chief, he has a lot more work to do.